Tiber River, bridge and reflections on water. Night Rome, Italy. Night photography of Rome, Italy. 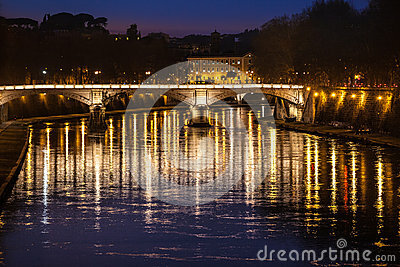 Tiber River, bridge and reflections in the water. Historical building at the top. Ponte Giuseppe Mazzini, also known as Ponte Mazzini, is a bridge that links Lungotevere dei Sangallo to Lungotevere della Farnesina in Rome (Italy).